KARUNA is a Sanskrit term used in ‘Hinduism, in Buddhism and Zen, which means “compassion” or compassionate action. Karuna Reiki opens up the possibility to work in a closer connection with All and for being enlightened spiritual masters, inspite of the faith of all of us. Both those physically present, that those who are pure spiritual state. 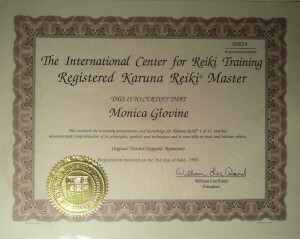 To attend a Karuna Reiki course, is essential to have received at least the 2nd level of Reiki. The method was developed by an American Karuna Reiki Master, William Lee Rend, whom, together with other Reiki Masters, did an extensive research in the East. Names such as: Marcy Miller, Kellie Ray Marine, Pat Courtney, Catherine Mills Bellamont Abraham and Mary, whom, with William Lee Rend, obtained the Karuna symbols through research and channeling, and they have a very value responded experienced. Karuna Reiki works directly on all energy bodies. Karuna operators have direct experiences with teachers, spiritual leaders, and with your higher self. An important purpose of Karuna Reiki method is healing with light and set free from shadows. Painful experiences, limitations, wrong programming that we had in the course of life, or creating situations appearing difficult to solve. Karuna helps us to set free from these constraints, to discover our true self and frees our creativity. We create our own reality, but not only that, also the unconscious conscious. Karuna Reiki breaks the causes that can block sometimes the existence or make us have repetitive episodes. The part of the mind that creates unwanted experiences is the shadow self. Your outer reality is a reflection of inner reality. Thanks to the Karuna REIKI method, once you healed the shadow-self is certain you will no more attract negative experiences, or they will not affect you negatively anymore. Karuna Reiki was brought to Italy from the United States, on October 6, 1996 by Laura Ellen Gifford and Melinda De Bear, initiated directly from William Lee Rend. Monica Giovine, in ’97. 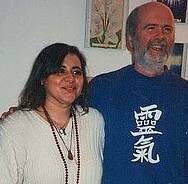 Monica Giovine repeated the course of Karuna Master Reiki William Lee, directly from Rend in Milan (Italy) in ’97. Monica Giovine is registered with No. 30824, at “The International Center of Reiki Training”, Southfield, Michingan USA, which William Lee Rend is the President. a second level course where you are given other 4 additional spiritual tibetan symbols. 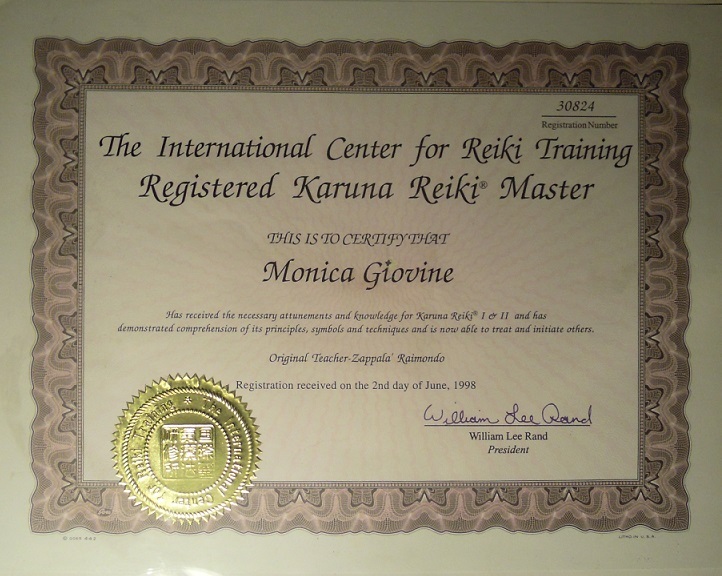 A course of Karuna Master Reiki to become a Karuna Reiki teacher. Please, click on image to enlarge!